domnop thom mountain, Kam­pot province – Sloshing and slipping through the warren of flooded mountain paths that snake through the Damrei mountain range, the advance force of RCAF soldiers ar­rived at their rendezvous point late Tuesday morning after a tough five-hour march from their search base camp in Chhuk district. The two dozen or so members of Prime Minister Hun Sen’s personal bodyguard unit, around 100 of whom were deployed Tuesday to lead the search for the missing Progress Multitrade Co plane in this part of Kampot, had tramped through constant rain that began before dawn to reach this meeting point with Nhim Vanda, first vice president of the National Commit­tee for Disaster Management. Leading the search for the An­tonov An-24 and its passengers, Nhim Vanda, who is also a CPP lawmaker, had set out into the mountains at first light on the back of a small motorcycle. Having slept in a hastily set-up camp on Monday night, Nhim Vanda said he focused on this point in the forest—where on Tuesday three cloud-covered mountains met—after receiving in­formation from locals living in the area who had said they heard the sound of a struggling aircraft on Monday morning. But by lunchtime, the cloud cov­er over the Domnop Thom, Ba Lan and Thlan Muoy Roy mountains, as locals referred to them, had made assistance from search helicopters based in Kampot impossible. Nhim Vanda had to break the tough news to the arriving search party that their five-hour march had been in vain and they would be better off marching back to the base camp until the crash site had been positively located from the air. Food and shelter were not available for the arriving searchers, he said. Nhim Vanda also announced that locals in the mountain areas would be helping in the search and that a $1,000 reward had been offered to the first person to find a victim of the crash. “We are not sure where the plane crashed,” he said, standing in a wet poncho on a muddy path. “So it would be better if you returned to camp and come back tomorrow when the helicopter finds the real site,” he told the arriving soldiers. With the passengers and crew still missing more than 24 hours after they were believed to have crashed in this accordion-like chain of mountains and hills, Nhim Vanda said his hope was diminishing. The arriving troops, who set out with enthusiasm five hours before, also appeared to be feeling a sense of hopelessness in the face of their task and apparent poor preparation for their search and possible rescue mission. Many had discarded their boots and were walking barefoot as the best way to cope with the unforgiving mud. Many didn’t appear to have rain ponchos and walked for hours in sodden camouflage uniforms with their belongings in at best, knock-off brand-name backpacks, but mostly small fabric suitcases tied at the handles with karmas so they could sling them over their shoulders. Few appeared to have hammocks and mosquito nets and all complained that they had brought only a few boxes of dried instant noodles to sustain them in their work and which they still shared with a reporter. Two came dressed in bodyguard uniforms and uncomfortable-looking city shoes, though their incongruous dress code didn’t stop them getting to the search area. Strung out in small, separated groups as they ascended into the thickly forested hills, the troops were forced to shoot several bullets into the air to try and locate each other. Local police and military officers from Chhuk district who had accompanied Nhim Vanda said that without air support scouring the tree tops, ground search parties were largely futile as the thick forest prevented visibility from the pathways to just a couple of meters. Contacted late on Tuesday evening by telephone in Chhuk district, Nhim Vanda said he was confident that the location of the downed plane was now known and that the troops he met on mountains would be reinforced with more men and material needed for a prolonged stay in the forest. “Today it was very difficult. I sent one helicopter to search but it was so dark that it could not see. 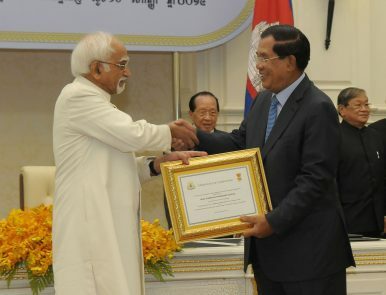 I hope that tomorrow afternoon we will receive a result,” Nhim Vanda said. As rains subsided late Tuesday, several groups of six to 10 male villagers from Chhuk district were making the trek into the hills carrying water, food provisions and machetes to help in the search, spurred on by the news of a $1,000 reward for finding the crash victims. Chin Rith, 41, a Chhuk district local who drove one of the small motorcycles ferrying Nhim Vanda and some assistants around treacherously muddy paths in the search area on Thursday morning, had predicted early on that the reward would help the search and locate the site. “I have hope we can find them,” he added.